The cartoons included on the set are uncut, unedited, and digitally restored and remastered from the original successive Technicolor film negatives (or, in the case of the black and white shorts, the original black and white negatives). However, some of the cartoons in these collections are derived from the “blue ribbon” reissues (altered from their original versions with their revised front-and-end credit sequences), as the original titles for these cartoons are presumably lost. Looney Tunes Golden Collection Season 6 Episode 38 Ride Him, Bosko! Looney Tunes Golden Collection Season 6 Episode 36 You Don’t Know What You’re Doin’! Looney Tunes Golden Collection Season 6 Episode 32 Smile, Darn Ya, Smile! Looney Tunes Golden Collection Season 6 Episode 6 Raw! Raw! Rooster! Looney Tunes Golden Collection Season 3 Episode 15 Duck! Rabbit, Duck! Looney Tunes Golden Collection Season 2 Episode 59 What’s Opera, Doc? Looney Tunes Golden Collection Season 2 Episode 49 Have You Got Any Castles? Looney Tunes Golden Collection Season 2 Episode 26 Whoa, Be-Gone! Looney Tunes Golden Collection Season 2 Episode 23 There They Go-Go-Go! Looney Tunes Golden Collection Season 2 Episode 20 Ready, Set, Zoom! Looney Tunes Golden Collection Season 2 Episode 19 Stop! Look! And Hasten! Looney Tunes Golden Collection Season 2 Episode 17 Going! Going! Gosh! 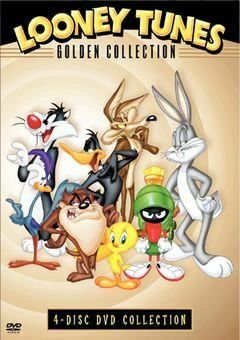 Looney Tunes Golden Collection Season 1 Episode 51 Tweety’s S.O.S. Looney Tunes Golden Collection Season 1 Episode 6 What’s Up, Doc?